...that my face is up there at Topaz Horizon. The lovely Frances Sales of Topaz Horizon is hosting a contest. 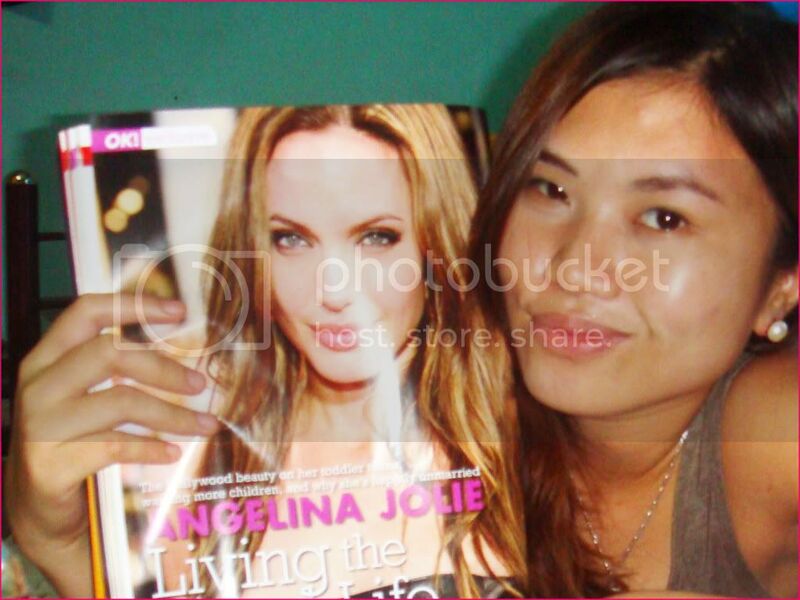 Just pose with the December issue of her magazine, Ok! and your favorite story in this ish and you can win a jar of the most expensive moisturizer on earth! Like what I've mentioned, I actually bought the magazine even before I read about the contest. If you're an avid reader of Frances' blogs (she writes for a beauty blog, too! ), you'd be enthused just by reading her entries! Teeyah says, "My favorite story was the one on Angelina Jolie. To me, it was an answer to some of the letters to the editor who asked you to quit glorifying a couple who wasn't married. I do get their point but in the 21st century, while I still respect marriage and its sanctity, I also look up to a couple who are living lives that contribute to the world. I, for one, think that they are the ones who've inspired celebrities to adopt (like Madonna, for one) and that, to me, is a very beautiful thing. Oh, and it doesn't hurt that they're both gorgeous, too!" Thanks, Teeyah! But let the celebrity insider in me just straighten this out: Brangelina did NOT inspire Madonna to adopt. In fact, when reports surfaced that it was Angelina who helped her to decide on that and Oprah asked her about it, Madonna bristled and said, "I don't know Angelina." Oh and her post about my entry is one of the many things that proves why she is Ok! Magazine's Editor in Chief! The girl knows her Hollywood and it's amazing! You have to go to her blog to read the rest of the celebrity tidbit, though. Again, kudos to you and your team, Frances! And cheers to more great Ok! issues! To my reader/blogfriends who've got the December issue of Ok! Magazine on their shelves, pose and join away! On a personal note, I have a big event today (yes, something to do with a big celebrity, too) and I feel like I'll spontaneously combust. This had been the biggest project I ever handled and well, do wish me luck!